Click the "play" arrow to listen online, or click the download arrow to download the audio for offline listening. But I say, walk by the Spirit, and you will not carry out the desire of the flesh. For the flesh sets its desire against the Spirit, and the Spirit against the flesh; for these are in opposition to one another, so that you may not do the things that you please. But if you are led by the Spirit, you are not under the Law. Now the deeds of the flesh are evident, which are: immorality, impurity, sensuality, idolatry, sorcery, enmities, strife, jealousy, outbursts of anger, disputes, dissensions, factions, envying, drunkenness, carousing, and things like these, of which I forewarn you, just as I have forewarned you, that those who practice such things will not inherit the kingdom of God. But the fruit of the Spirit is love, joy, peace, patience, kindness, goodness, faithfulness, gentleness, self-control; against such things there is no law. 24 Now those who [e]belong to Christ Jesus have crucified the flesh with its passions and desires. 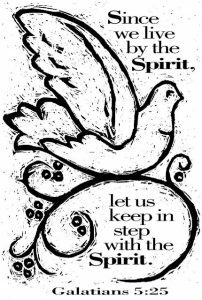 If we live by the Spirit, let us also walk by the Spirit. Let us not become boastful, challenging one another, envying one another. Even so consider yourselves to be dead to sin, but alive to God in Christ Jesus. Therefore do not let sin reign in your mortal body so that you obey its lusts, and do not go on presenting the members of your body to sin as instruments of unrighteousness; but present yourselves to God as those alive from the dead, and your members as instruments of righteousness to God. For sin shall not be master over you, for you are not under law but under grace. What then? Shall we sin because we are not under law but under grace? May it never be! For what I am doing, I do not understand; for I am not practicing what I would like to do, but I am doing the very thing I hate. But if I do the very thing I do not want to do, I agree with the Law, confessing that the Law is good. So now, no longer am I the one doing it, but sin which dwells in me. For I know that nothing good dwells in me, that is, in my flesh; for the willing is present in me, but the doing of the good is not. For the good that I want, I do not do, but I practice the very evil that I do not want. But if I am doing the very thing I do not want, I am no longer the one doing it, but sin which dwells in me. I find then the principle that evil is present in me, the one who wants to do good. For I joyfully concur with the law of God in the inner man, but I see a different law in the members of my body, waging war against the law of my mind and making me a prisoner of the law of sin which is in my members. Wretched man that I am! Who will set me free from the body of this death? Thanks be to God through Jesus Christ our Lord! So then, on the one hand I myself with my mind am serving the law of God, but on the other, with my flesh the law of sin. Therefore there is now no condemnation for those who are in Christ Jesus. For the law of the Spirit of life in Christ Jesus has set you free from the law of sin and of death. For what the Law could not do, weak as it was through the flesh, God did: sending His own Son in the likeness of sinful flesh and as an offering for sin, He condemned sin in the flesh.